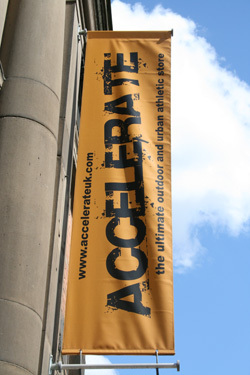 Accelerate was conceived from a desire to find one running store where we could shop for everything running. We wanted the best service, knowledge and experience and a friendly approach to our sport. No one seemed to want to put it all together. So that's where the idea of Accelerate came from. Accelerate began by visiting events with a retail event store and with a website. Eventually the Sheffield store opened its doors in February 2009. Accelerate is actively involved in the local running scene and in 2009 began the Gritstone Series - a number of established fell races, bringing them together as one series. The store grows by recommendation and draws runners from far and wide. We continue to look at ways of offering more. Having teamed up with Accelerate Performance Centre, bio-mechanics assessment, soft tissue therapy treatment and podiatry is available at Accelerate. Just loves all things running. Coached to national level, written for all the national running magazines, early advocate and writer on heart rate training principals. One of a rare breed who never knows when to ‘give in’. National podium finisher in 24hr MTB racing, regular winner in adventure racing and has completed the full Ultra Tour de Mont Blanc. Discovered running in his 30s, when dared to try a Cross Country. Has since competed on Road and in Fell runs from 10k to Ultra distance, finishing as first Brit in the Iceland Ultra Marathon 2009. Likes getting dirty. At 40 Nic put her priorities in order and running came near top of the list. Triathlons and Road Marathons under her belt, she has since added off-road to her skill set. In the last 2 yrs, she has already surprised herself with a win in her category. Accelerate: Sheffield and the Peak’s Largest dedicated Running Store Road Running, Fell and Trail, along with Adventure Racing are all covered in store. A wide choice of product is backed up with an unprecedented level of experience and running knowledge. At Accelerate we love our running, we would suggest it shows. A large range of road shoes, for training and racing, is complemented by the areas largest selection of trail and fell shoes. We complement this with kit and gear suitable for high mountain and fell use, including mountain marathons. If you can find the product on this website it is also available in-store and at that price. This is Accelerate, what you see is what you get. Call in, the kettle is on.